M.J. Evans has combined her love of horses with her love of fantasy by creating her second series. (The first is "The Mist Trilogy.) As a life-long equestrian, centaurs were the perfect fantasy creature to use for this award-winning series. M.J. lives in Colorado with her husband, three horses and a standard poodle. She loves going on trail rides in the Colorado mountains and competing in Dressage. 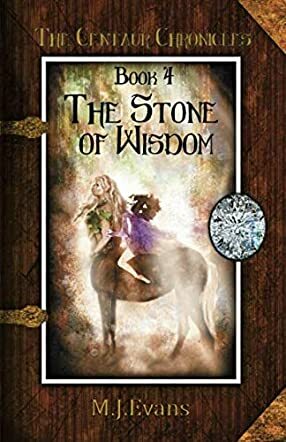 The Stone of Wisdom begins with Carling and her friends searching for a diamond, the last jewel to complete her Silver Breastplate of Righteousness. Meanwhile, the evil wizard, Xantar, comes back to Crystonia to gather an army to defeat the little half fairy/half human girl. Crystonia is a mysterious land that holds several races of creatures that this young girl must unite in order to rule successfully. Almost two years ago her quest began and although her main objective was to find the missing stones that completed her breastplate, her kindness drew others to her. In completing her mission, Carling found she had endeared herself to the Centaurs, Ogres, Cyclops, fairies, and ice horses that lived within her realm. You will find adventure, courage and wisdom as Carling the Duente completes her quest beside her friends. M.J. Evans's distinct writing style is very descriptive and gives the reader a vivid mental picture of the scenes within its pages. The Stone of Wisdom is the fourth book in the Centaur Chronicles, but can be read alone since past events are explained. Evans's experience as a teacher is obvious in her writing skill and organized short chapters, making this book a pleasure to read. Aside from the evident pursuit of the jewel, this novel is woven with character traits that accentuate the makings of a person who would be a good friend or leader. The main character had to make hard decisions with her friend, but she also knew when she had to stand alone. I would recommend this novel to young people, but as an adult, I also found it an excellent read. The Stone of Wisdom by M.J. Evans is the fourth book in the Centaur Chronicles. After collecting three of the stones needed to fill her magical Silver Breastplate (the stones of Mercy, Courage, and Integrity), teenage heroine Carling, who belongs to a half-human, half-fairy race called the Duende, is confronted with a great challenge. She must find the Stone of Wisdom and put it to use while an evil wizard tries to unite three races of Crystonia against her potential rule. Owning the Silver Breastplate makes Carling the rightful ruler of Crystonia. Although many are willing to accept her—including her friends, the Minsheen centaurs, and her own race, the Duende—the wizard Xanbar wants the throne for himself. And does Carling have what it takes to find the Stone of Wisdom in the first place? The Stone of Wisdom is an impeccable YA fantasy read. Great for some middle-graders as well, the story has a developed world that creates an exciting place you can sink into each time you open the book. Multiple races of people in Crystonia—Fairies, Fauns, Centaurs, Duende, Cyclops, and Ogres—are fleshed out with good descriptions. M.J. Evans has a strong ability to build a very complex situation between warring races while still keeping the story fast-paced and active, and brave, strong-willed Carling was a Future-Queen-With-a-Heart-of-Gold. She won my attention through the sincerely likable and honest way she approached challenges, and the lessons she learned about what it takes to be a real leader rang true. Characterization is strong—the villains have enough comedy or frustration with each other to give them depth, and the heroes have doubts, foibles, and preoccupations that lend scope and heart to their journey to rule a kingdom.